FINE FILIGREE BRACELETS AND PENDANT by Andrea Usai from Sardinia. Usai makes extremely intricate and fine filigree, which at first glance is suggestive of granulation. The secret may be in his delicately twisted wirework. Using the traditional method, two wires are placed on a wood board, then another board is put on top and the wires are rolled in between the wood. This results in very finely twisted wire, the basis of filigree. Photographs by Robert K. Liu/Ornament Magazine. High ISO was used in the show tents, where the lighting was varied; for closeup shots, an external flash and macro lens were used. ANDREA USAI, of Kokku, from Sardinia, an island off Italy, with a client in his booth. The International Folk Art Market (IFAM) in Santa Fe, now in its fourteenth year, is an enormously successful market for one hundred fifty artists or collectives from fifty-four countries. Ornament has often covered this event in the past, from 2012 to most recently in 2016 (Ornament Vol. 39, No. 1, 2016). This year, the Ornament staff attended IFAM, where the huge crowds of enthusiastic attendees braved long lines and intermittent rain. The incredible diversity of folk art, live music and good food were more than adequate compensation. In 2017, both attendance and sales increased over last year. Ninety percent of the money goes home with the folk artists, where these earnings make an important contribution. Some artists saw their sales double, to over twenty-one thousand dollars, a substantial amount for a weekend event but possibly the average, although knowledgeable local observers say some sell far more. One possible downside to IFAM may be that there are now far fewer ethnic art dealers in Santa Fe. As with well-attended shows, conditions are not good for interviews—veteran members of the press never want to interfere with sales of their subjects, and the close conditions in the tents left little room even to photograph. I chose to cover five jewelers out of about twenty booths that carried jewelry, but was only able to shoot macro images of three of their works. The jewelers we covered came from Ecuador, India, Macedonia, Niger, and Sardinia. Interestingly, a number of the jewelers have partnered with someone in the United States, like Elhadji Koumama of Niger and Jorge Moscoso of Ecuador. This makes sense economically and practically, especially regarding funding and having a wider distribution. Except for Dharmendra Soni, whose work was in the “Enduring Splendor” show at Fowler Museum at UCLA, where he met Patrick Benesh-Liu (Ornament Vol. 39, No. 5, 2017), we did not know any of these jewelers previously. ELHADJI KOUMAMA, from Niger, and MARIE FLAHERTY, from Satuit Trading Company, Massachusetts, who was helping Koumama and carries his jewelry in her own firm. The Koumama family have been jewelers for twenty-five generations and now use fine silver, stone (primarily carnelian), ebony and glass in their jewelry. He is wearing the traditional indigo-dyed headdress. Surprisingly, it is perhaps Tuareg jewelry of West Africa that is the most well known in the world market. Elhadji Koumama, like many jewelers from that part of Africa, are often itinerant and have now established themselves in Europe or America, while maintaining a base in Niger or Mali. While many elements of Tuareg jewelry are still derived from traditional symbols like the Agades and other crosses, as well as the talhakimt, other aspects appear to be adaptations to a more Western taste. Dharmendra Soni, from Jaisalmer, Rajasthan, sells a mix of jewelry, both traditional and his own designs, employing casting, repoussé, stampwork, and many other techniques. The other three jewelers, Jorge Moscoso from Ecuador, Katarina Doda of Macedonia and Andrea Usai of Sardinia, all work in filigree. Usai works in gold; Moscoso in gold and silver; and Doda in silver alone. 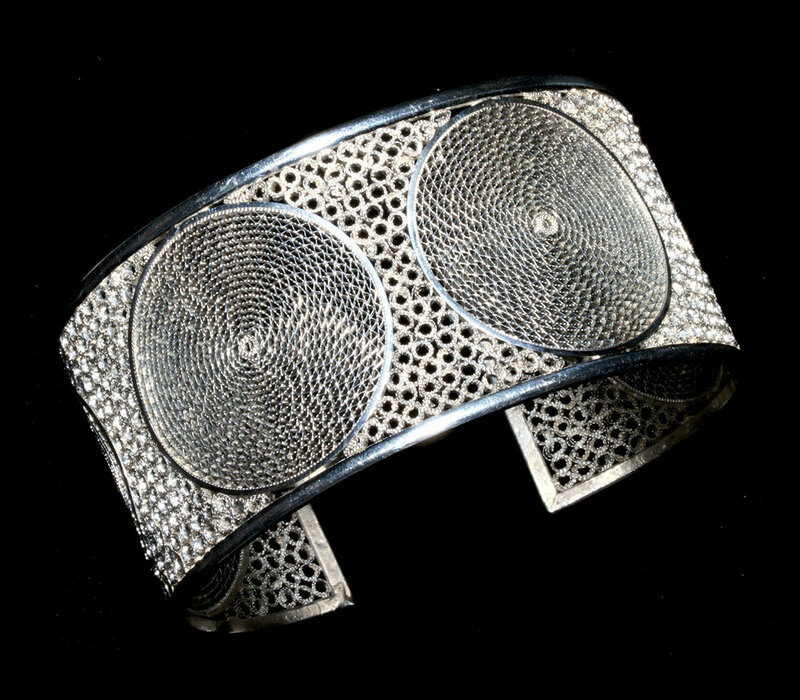 KATARINA DODA, from Macedonia, makes a wide variety of jewelry utilizing the filigree technique. Her parents make equipment for jewelers, like furnaces and specialized tools for filigree work. Doda has had wide experience selling internationally and apparently has many fans of her filigree jewelry. The closeup of a bracelet demonstrates her skill; she only studied jewelrymaking in 2010, and established her jewelry business after six months of schooling. The use of the filigree technique is widespread, especially around the Mediterranean countries, and in the Iberian peninsula, from where it spread to the Americas. Usai works in both open- and ground-supported filigree, while Doda and Moscoso use openwork filigree. Filigree is a technique that uses the minimum of material for a maximum of volume and lightness. It can consist of only wirework, or it is combined with granules. Because granulation often involves fusion, this may also be utilized by these jewelers. Most filigree consists of unit construction, whereby wire frames contain thinner wire designs within, held in place by tension before soldering. The processing of the wire used in filigree is crucial, involving annealing, straightening, twisting, and flattening. The prepared wire is then shaped or formed, often requiring very delicate work with fingers or tweezers. Besides the opportunity to see so many handmade crafts from around the world, and meeting their makers, this type of show offers students of craft a chance to see how craftspeople, in this instance, jewelers, treat one technique like filigree in many different ways. Next year the International Folk Art Market meets July 13-15, 2018. DHARMENDRA SONI, from Rajasthan, India, at his booth; he was one of four jewelers who participated in “Enduring Splendor,” an exhibition of Indian jewelry at the Fowler Museum at UCLA. 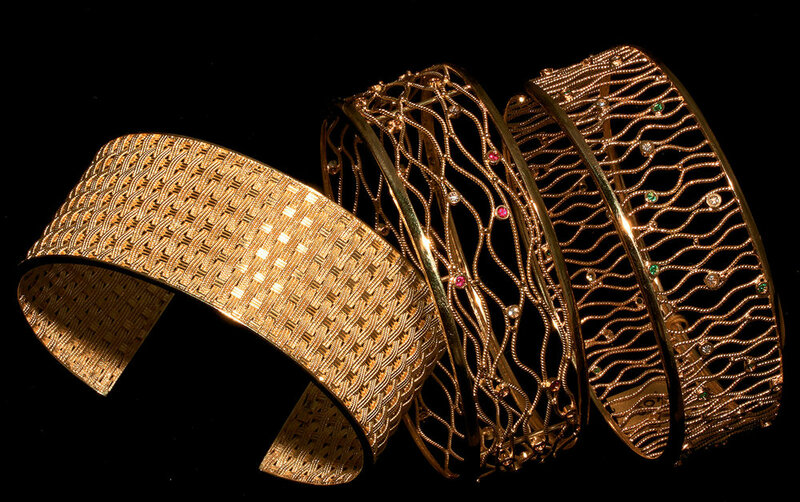 Shown are a large selection of bracelets, traditional and Dharmendra’s own designs, made by a variety of techniques, including casting, repoussé, stampwork, and stone-setting. India has a long tradition of fine metalworking and jewelrymaking. Dharmendra Soni belongs to a caste of jewelers known as sonis, thus his family name signifies his occupation. SUSAN BELL AND JORGE MOSCOSO, respectively from Santa Fe, New Mexico, and Cuenca, Ecuador. Bell met Moscoso while vacationing in Ecuador. At that time, his jewelry was in base metals. She arranged to fund his work in silver and gold, thus widening his market through Belle Gold Fine Jewelry in Santa Fe. Moscoso’s work is exceedingly fine openwork filigree. A mixture of silver and copper is used for the finely powdered solder, with borax as the flux. Then the torch flame is carefully applied, taking into consideration the finer and larger components to be heated and soldered. The work is produced among colleagues in his workshop.